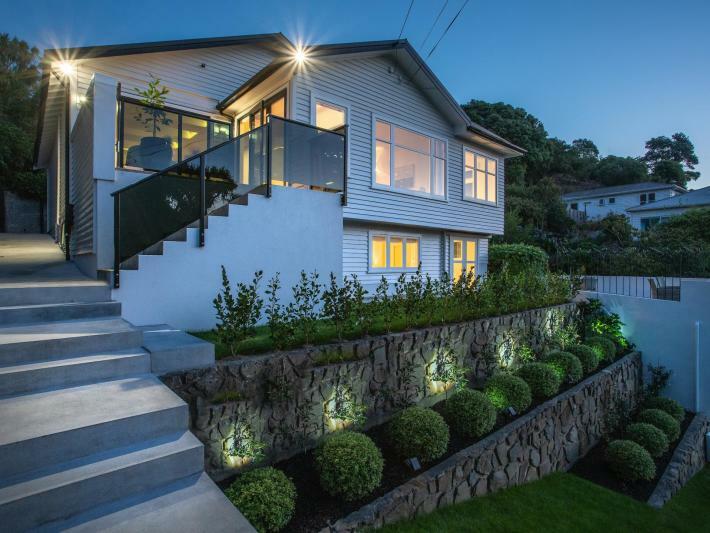 This stunning four double bedroom, three bathroom, 1920's elevated bungalow with extensive contemporary renovations ...exudes glamour and understated quality. Flat drive on to a single garage with automatic door opener and the local bus stop conveniently close. A gentle walk up past the attractively landscaped garden to an elevated deck with dual access into the property entrance, sets the tone and whole heartedly welcomes visitors. Stylish Informality is evident in the simple layout of this space and it's openness to the outdoors. The designer kitchen acts as the central hub of the home and features two large pantries and extensive storage options. Black and white surfaces are sleek and reflective, to maximise the sense of light and combines with the feature skylights to add sophistication to this casually elegant kitchen/dining/family space. Fully retractable double glazed steel doors open up the entire room onto the northwest facing deck to maximise the sun and views. An internal slider divides the family/kitchen space from the formal living room. A large feature window frames the lush undulating hills and bush views. The upper floor accommodates three double bedrooms with a new family bathroom included. The master bedroom with en-suite bathroom is graciously appointed. Access to the rear of the property from this upper floor flows to a private and sheltered space and deck with separate studio for hobbies. Centralised stairs direct visitors to the gently sloping lawn with resident hen house/hobby room. Clever foresight by the current owners mean that there is further potential for building on this site, however, this option would require the Wellington City Council approval processes.